Lathyrus odoratus, commonly known as Sweet Pea, is a bushy or climbing annual that features highly fragrant flowers (“odoratus” meaning fragrant) on winged stems clad with medium to dark green leaflets in pairs. Sweet Pea is known as the Queen of the Annuals. It grows and flowers best during cool weather. It adds a touch of elegance and, depending on the variety, fragrance, to any garden bed or container. Heirloom varieties tend to be the most fragrant, while modern varieties have a wider variety of plant sizes. Sweet Pea is a great cut flower for arranging and bringing the scents of summer indoors. There is nothing more enticing than a vase full of fragrant Sweet Pea blossoms. It need support to grow, but the tendrils are strong so Sweet Peas will cling to many objects such as fences, thin poles, netting and wire. Sweet Peas are best sown in a full to part sun location directly in the ground on well-drained, compost amended soil in spring. 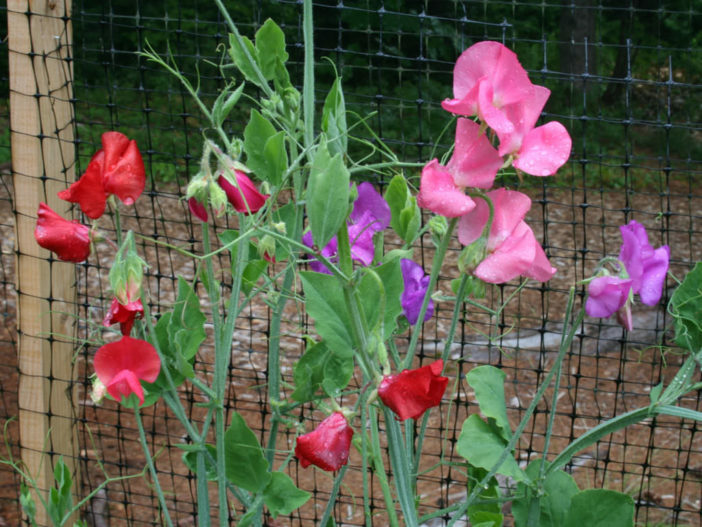 Plant climbing Sweet Peas along a fence, trellis or wire. Bush varieties can be planted in containers. Nick the seeds with a nail file and soak them overnight in warm water to hasten germination. Plant once your ground has dried out, spacing the seeds 6 inches (15 cm) apart. In cold areas, to get an earlier flowering crop, consider starting Sweet Pea seeds indoors in pots 4 to 6 weeks before your last frost date. Since Sweet Peas are a Legume, they need little additional fertilizer. They do grow best on a neutral pH soil, so add some lime if your soil is acidic. Keep the soil evenly moist for good germination and growth. Sweet Peas may dry up and die in mid summer in warm climate regions. Enjoy the early summer crop and consider planting a crop in mid summer for fall. Deadhead spent flowers to encourage more blooms. Avoid planting in the same location each year since diseases can build up in the soil to attack the Sweet Pea plants. They also sometimes get powdery mildew disease. Space vines further apart to increase air circulation to avoid this fungal disease. Unlike Garden Peas, Sweet Peas are poisonous and can’t be eaten. Grow tall varieties along a fence, lattice, up a lamppost or thin pole, on a teepee or in a cutting garden. Plant bush varieties in containers or window boxes. Plant fragrant varieties close to the house or windows where they can be enjoyed. Sweet Peas pairs well with Peonies and Roses. They also can grow up the stalk of tall flowers, such as Sunflowers, adding color before the Sunflowers bloom.